Often the trickiest part of creating shareable stories is writing them to fit a specific word count or space. How exactly do you tell someone’s life story in less than fifteen words? Or fifty words? Or even 400 words? We are going to explore that in the final part of The Non-Writers Writing Guide for Genealogists. My suggestion is to think of every sentence as a mini-story that is leading you to the next instalment. So, when you write ancestor snippets, they should encourage the reader to want to learn more. The Oxford Dictionary definition of a snippet is “a small piece or brief extract.” And that is what we are creating when we write ancestor snippets for bookmarks, snapshots and trading cards. These are brief extracts of our ancestors’ lives. Therefore, we don’t need to know everything about that ancestor to start telling their story. You can approach this by writing the longer ancestor snippets first and extract an intriguing sentence or two. Another option is to think of it like a newspaper headline; it should be eye-catching and engaging. What will invoke emotions like joy, anger, curiosity or empathy when someone glances at it? 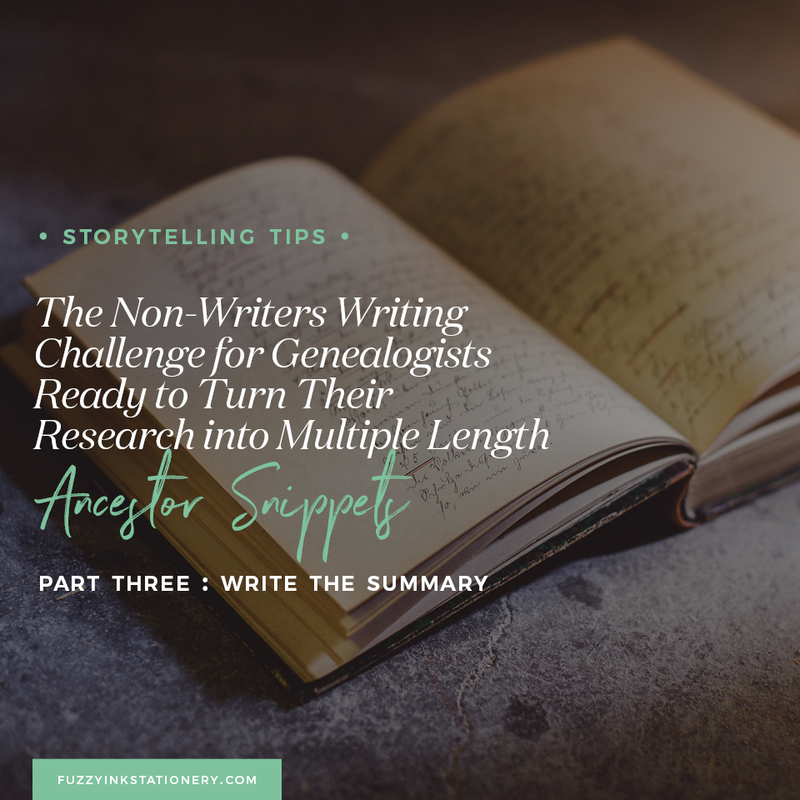 Have you completed the exercise for Part 1: Build the Foundation of The Non-Writers Writing Guide for Genealogists? If so, then you’ll have a selection of sentences ready to go. Did you also add in what was discovered in Part 2: Find the Story? Because if you did, then you’ll have the longer piece ready to review and rewrite. All of the activities from The Non-Writers Writing Guide for Genealogists can be done separately or completed in order. There will be a PDF workbook available to download from the Resource Library with each instalment. 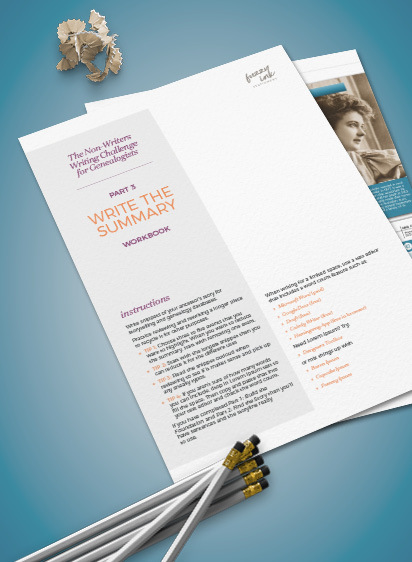 Grab the Part Three: Write the Summary workbook from the Resource Library now. An online text editor perfect for distraction-free writing. Easy-to-use simple formatting (headings, bold, italics, bullets etc.) available. Draft is free to use online software to provide a distraction-free writing environment perfect for a collaboration with others. I tend to write very long sentences, so I love Hemingway App. It is free-to-use online software. It flags grammatical errors to keep your writing easy-to-read. Remember that they are suggestions only so you don’t have to change something if you know it works! There isn’t a save option, so make sure you copy any updates into your word processing software. Before we get started writing, reviewing and rewriting our ancestor snippets, we need to know what story we are telling. Of course, how much we can say will vary based on the word limit. While the focus can be the same, obviously we can say more in 400 words than we can in fifteen! While you may use your ancestor snippets for different purposes, including online family trees, the process will be the same. Don’t forget to check if there is a word limit before you start writing! I’ve used the US Classic Ancestor Snapshot template for Google Docs to do this exercise. I can add about 340 words for a one-page summary. The word count will vary depending on the number of headings used, and the length of the introduction. When you look at your ancestors’ lives, pick out the highlights that are the most intriguing. Remember that these are ancestor snippets, not the whole story. You only need to include enough to engage emotion in your reader. Will it be it their war service? Or did they settle in the toughest part of the country and create a thriving business? Were they a sporting legend? Or live in the first city to have the public transport? What story are you going to tell? 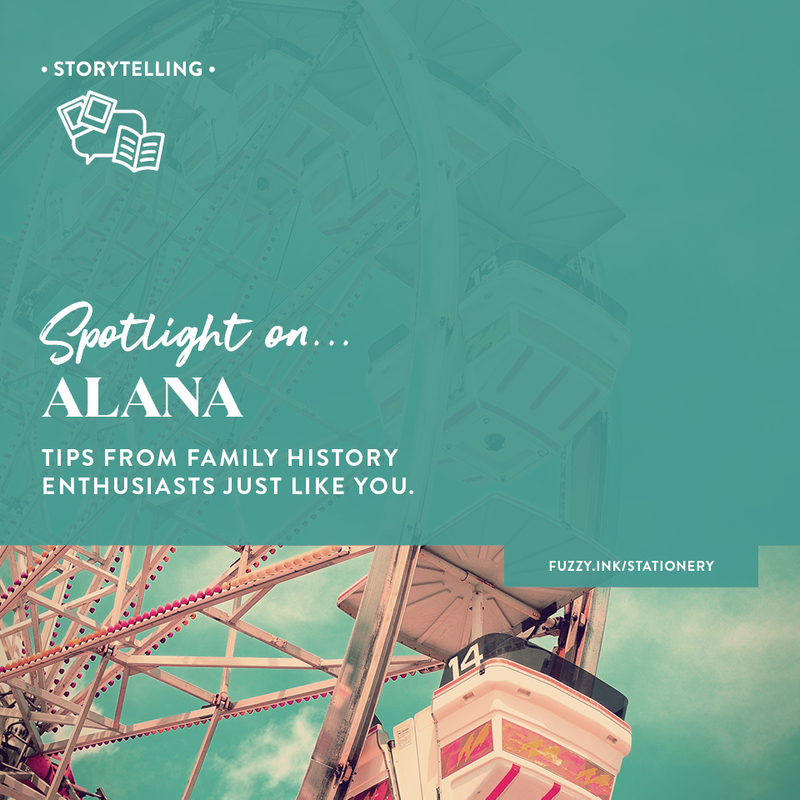 Exactly how can you know which points are going to engage your audience when you write ancestor snippets? I pick the parts that intrigue me because I find them easier to write. I try to pick two or three pieces that will create different emotional responses. Think of this as a mini-movie and your ancestor is the star. Do you want to create a hero or a villain? Is it a drama or a happily-ever-after? You get the point. Let’s take a look at what I’ve done. The introduction is written to evoke curiosity and encourage the audience to keep reading. The headings are to separate topics while introducing the next one. I wanted to create an image of romance, adventure and drama. How did I do? Because I had already decided what story I wanted to tell, I was able to quickly assemble my ancestor snippets. I took sentences created in Part 1, then added in social influences from the timelines developed in Part 2. Then I only had to review and rewrite the paragraphs for readability and to keep within the word limit. If you haven’t completed Parts 1 and 2, start with bullet points of things you know about your ancestor. Then rewrite those points to create paragraphs. When writing aim for three or four sentences and keep each paragraph to one topic, theme or idea. Use headings to group similar ideas together, as I have in the example above. 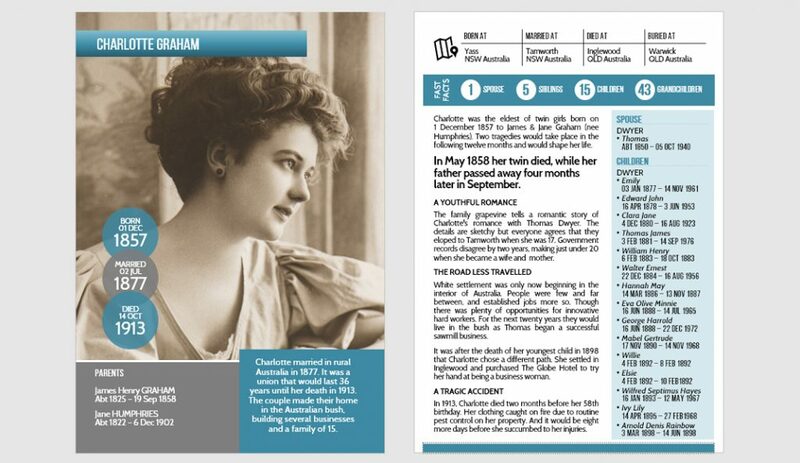 The Ancestor Trading Card template for Microsoft PowerPoint offers two opportunities for ancestor snippets. In my example, I have 38 words on the front and approximately 225 words on the back. The back uses the same copy from the Snapshot while removing some sentences to fit the word count. So how do you decide what to cut and what to keep? You will need to reduce the story you are telling. I’ve removed parts that are interesting tidbits but don’t affect the outcome. When I’m reviewing, I read it out loud. This trick will help you know if you have the punctuation in the right place and if it makes sense. You’ll also spot sneaky typos quicker too! On the front, I have taken those deleted sentences, rewritten and condensed them. 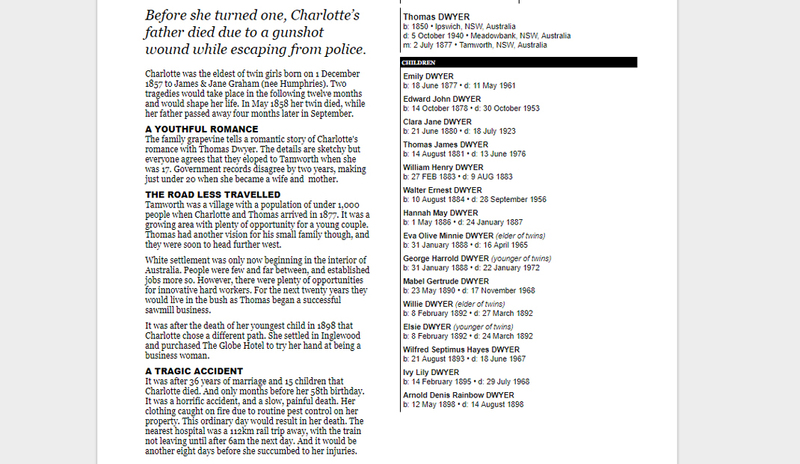 Creating this ancestor collectible has been quick and easy because I’d already put in the work writing Charlotte’s story. For the final task, I used the US Folded Ancestor Bookmark template for Google Slides. 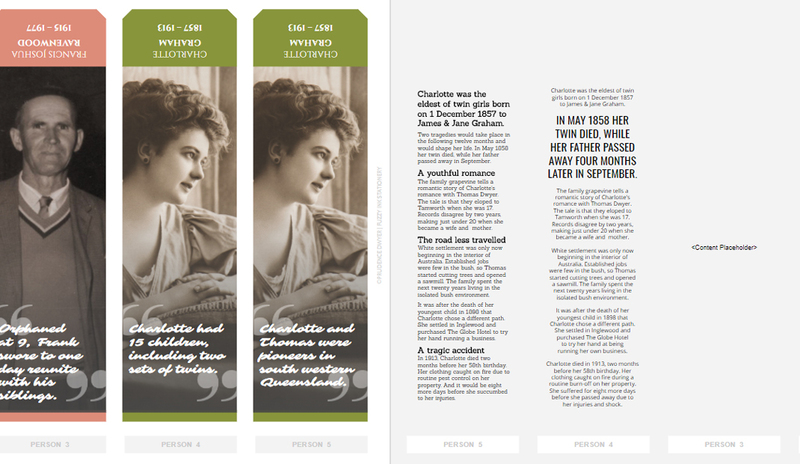 Like the Trading Card, this template also includes the option for two ancestor snippets. In the example below, you’ll see that I have used two different reverse layouts. I have copied the story from the trading card and altered it yet again. Every time that you reduce the word count, you will need to review and rewrite. Read it out loud to yourself to see if it makes sense. I’ve used different ancestor snippets on the front to show how short vs long words can make a difference. Both sentences have nine words, but the flow is entirely different due to their length. Both of the reverse layouts use the same snippet. The second has the headings removed and some other tweaks to keep the text within the visual area. As you’ll see from my examples, the bulk of the work happens in Exercise 1. Then it only took a few minutes to create the other pieces as I was reviewing and rewriting. And if you have completed the Build the Foundation and Find the Story exercises, then you are already halfway to done. Use the form fields in the workbook to keep your word count in check. Or open a new document in your favourite text editor and start typing. But don’t forget to keep an eye on the word count! Where will you use ancestor snippets? Will it make your genealogy research and storytelling easier? 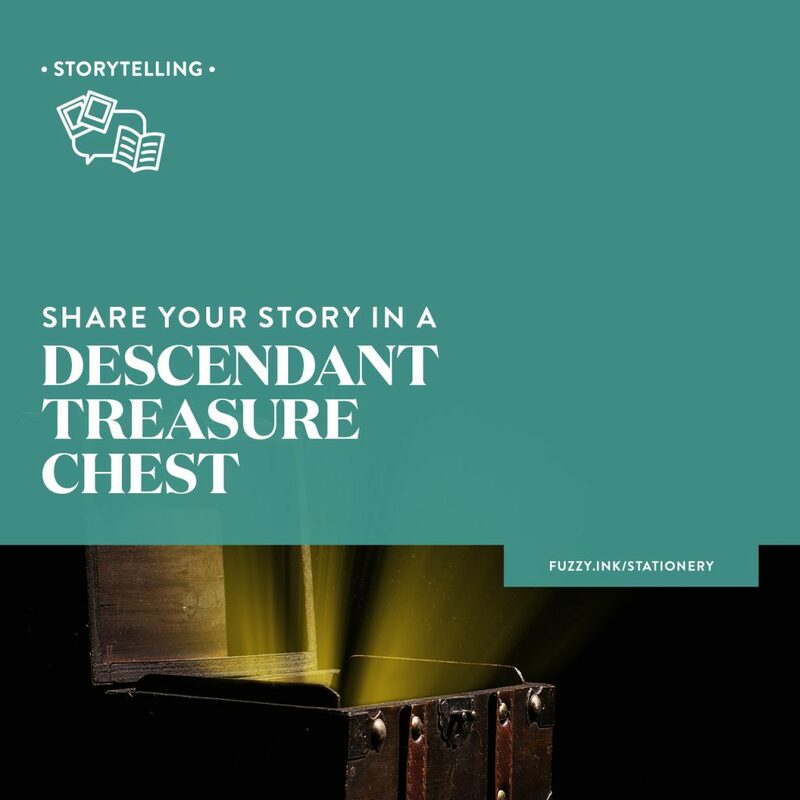 ​Write short, engaging stories about your ancestors. 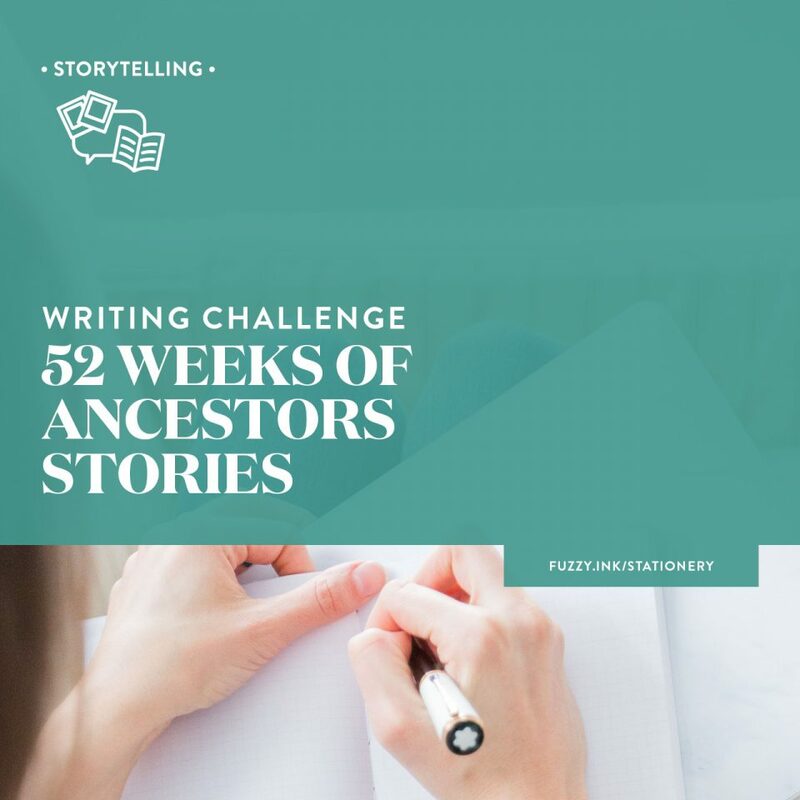 ​​This ​FREE ​PDF ​workbook ​of ​exercises ​for ​Part 3 ​of The Non-Writers Writing Challenge for Genealogists to help you ​​write snippets of your ancestors' stories ​to ​fit ​any word count.